Here at Woodbridge Hill Dental, we are strong believers in prevention being better than a cure. Our aim is to help you to maintain a high level of dental hygiene care so that you do not need to worry about painful or expensive treatment. Removing tartar and plaque on a regular basis is one of the key steps in maintaining your teeth. Our experienced dentists and dedicated team of hygienists will provide a tailored oral hygiene care plan depending on your needs once they have thoroughly evaluated your overall oral health status. Below, we will explain more about the treatment that we provide, as well as answering some of your frequently asked questions. Please do not hesitate to give us a call if you would like to book an appointment for dental hygiene in Guildford/Surrey or you require further information. A dental hygienist will educate you on how to maintain a healthy smile, ensuring you follow a good oral health routine and that you know how to clean your teeth properly. Of course, they will also provide an array of services and treatments to make sure that this is the case. This includes cleaning your teeth professionally using the latest polishes and pastes to get rid of the build-up of tartar and plaque. 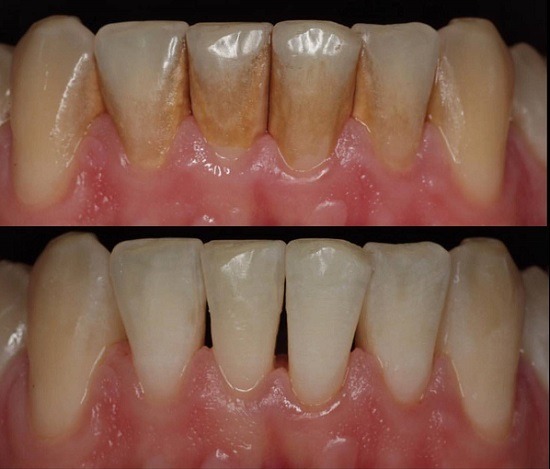 While brushing correctly is important, it cannot remove these deposits alone. This is why you need to see a dental hygienist every six months to ensure a white and confident smile. You may be feeling a bit apprehensive regarding your first appointment with a dental hygienist. There is no need to be. We will explain everything. Depending on your needs, you can expect your first appointment to take around one hour. Your dental hygienist will then advise on how many follow-up visits will be needed, and when they will be needed. If symptoms of periodontal disease (gum disease) have been found, or symptoms of another condition, for example, ulcers, you may need to have a quick follow-up hygienist session in Guilford, Surrey. If you experience bad breath, it is definitely worth mentioning this to your dental hygienist. There is nothing for you to be worried or embarrassed about; this is something that many people suffer from. It is known as halitosis when it is a chronic problem, i.e. it is something you experience all of the time. Your dental hygienist will be able to give you the knowledge and tools to treat the condition. Of course, there are a lot of people who suffer from bad breath and don’t realise it. In fact, it’s believed that two out of three adults have bad breath and don’t know it! However, this is something that can easily be treated and managed, and so it is certainly worth speaking to your dental hygienist about. Breath malodour tends to be a result of a certain bacteria, which produces sulphur, and lives within our throat and on the surface of our tongue. There are many different contributors to bad breath, including a dry mouth, sinusitis, tooth decay, gum disease, food trapping, and poor oral hygiene. There are a number of different ways you can treat bad breath, which your dental hygienist will explain in full. This includes scraping your tongue on a daily basis, as well as using mouthwash every morning and evening. Regular dental check-ups are also a necessity. Your dental hygienist will be able to put together the right oral care plan for you. They will assess your condition and then they will give you thorough instructions to follow, as well as providing a professional scale and polish service. You will typically be advised to follow-up with another visit around six weeks later so that the condition can be evaluated to determine whether the treatment has been effective. Of course, this all depends on the nature of your condition. If your bad breath is linked to a medical cause, it is vital that your condition is diagnosed as soon as possible so that the correct treatment can be given. Do you really need to see a dental hygienist? A lot of people assume that seeing a dental hygienist is unnecessary because they brush their teeth twice a day and they know how to have good oral hygiene. However, while this is imperative, it is not enough. Only a dental hygienist can effectively remove the buildup of plaque. If this is not treated, when the sugars from food and drink mix with the existing plaque on your teeth, it can cause severe damage to your gums and teeth. In the end, you may need to have a tooth removed because of the toxins that build up from this layer of bacteria. Can I drink and eat after hygiene treatment? If you did not receive fluoride as part of your dental treatment, you will be able to eat and drink as normal once the cleaning is complete. However, you should wait for at least half an hour before drinking and eating if you received fluoride treatment. What is involved in a scale and polish? A scaling instrument will be used so that your dentist can get rid of tartar and plaque from the surface of your teeth. You may need to have at least two or more visits to your dental hygienist, if there is extensive amount of plaque or there is plaque on root surfaces requiring a deep clean. How much does a scale and polish cost? In most cases, a Scale and Polish will cost £54 per session and Hygiene + Air polish from £80. This includes plaque removal and cleaning on both lower and upper teeth and proper stain removal with our advanced Air Polish system. Can I brush my teeth after a scale and polish? Once you have had a scale and polish, you should brush your teeth carefully while your gums are still sore. This means using a soft-bristled toothbrush and toothpaste that has been designed for those with sensitive teeth. You should also wait a day before flossing. I am a registered patient; can I see the hygienist whenever I want? You will be able to visit a hygienist at any time that is convenient for you. You do NOT need to a referral or prescription from a dentist and you do NOT have to see the dentist. Although it is recommended you see your dentist for routine check-ups every 6 months. Can I see a hygienist if I am not registered at your clinic? Yes, you can. We have information for new patients on our website or you can book your appointment online now. In most cases, you will not experience any pain. We make sure that our patients are fully comfortable – it is one of our priorities. However, you may experience some pain if you have a specific type of oral health issue. This will all be explained to you and you may receive local anaesthetic to full any potential pain. Contact Woodbridge Dental today if you have any queries about the dental treatments that we provide. Our opening hours are 8.00 am until 6.00 pm, Monday – Friday, and 8.00 am until 3.00 pm on Saturdays. You can call us on 01483 568 584. Alternatively, you can use our online booking form or send an email to reception@woodbridgedental.co.uk and we will get back to you as soon as possible. Click here to find out more about our offers and new patient deals.